Financial freedom. It sounds good. But what is it really? Is it freedom to buy new shoes on a whim? Splurge on fresh strawberries? Buy tickets to the Superbowl? Freedom to never ever work again? Freedom to never worry about money again? True financial freedom is the feeling of being without financial stress.With financial freedom, you have the independence to live stress-free. If an issue comes up, you don’t even bat an eye because you are secure in your finances to pay for the fix. Nothing impacts your finances. You know exactly what you can spend, are free to do what you want (within your budget), when you want and without worrying about financial consequences. No financial freedom: At this stage, you rely completely on your paycheck to cover spending and pay debts. It’s difficult to save money at this stage since you need every cent you make. Until you make more income, you remain in this stage. Getting out requires hard work and time. Temporary financial freedom: This stage requires a pool of savings. You must make more than you spend to remain in this stage. This isn’t restricted to raises and bonuses at work. You might get another job. You can even begin your own business or side hustle. Creating another income channel adds to your savings. More savings means more freedom. With this freedom, you can switch jobs, get more education, or even travel. These freedoms are only temporary, however. This is because you are using your savings to purchase these. This temporary freedom only lasts until your income is spent. Permanent financial freedom: In this stage, you have an iron clad written financial plan where your non-employment income greatly exceeds your spending. This non-employment income may come from a side business you enjoy. A side-business or blog are likely things that you are passionate about. You find fulfillment in what you do. This fulfillment decreases the need for overspending on non-essential things. Financial freedom and fulfillment in life go hand in hand. Each of us has different goals for our lives. We have different desires when it comes to financial freedom. Whatever your dream might be, dream big and go for it. Make your goals specific and tangible. Documenting your financial plans in an online retirement planning calculator can help you set and achieve these goals. can help you set and achieve these goals. Financial freedom sounds like a great idea, for those who can afford it. But affording it has less to do with how much you earn and more to do with how well you plan for it. There are lots of ways to accomplish financial freedom in retirement. Maybe you’ll continue working. Plenty of people do. Or maybe you’ll downsize and reduce your cost of living. That’s another common approach. And maybe you’ll choose a combination of strategies to arrive at a plan that’s uniquely yours. However you do it, the important thing is to think about it now instead of facing the realities later. Financial freedom sounds so glamorous. You might imagine a well-heeled couple on a yacht sipping champagne, but the truth is that freedom is all relative. A retired woman in West Virginia might have a completely comfortable lifestyle with Social Security as her primary source of income because she’s debt free and owns her home outright. And, a retired couple in South Florida could enjoy financial freedom because they sold the McMansion and bought a shared home on the beach with friends. A million-dollar portfolio might not be attainable for everyone. But then again, it might not be necessary as long as your finances are enough to cover what is important to you now and into the future. In an interview with NewRetirement.com, Todd Tresidder, creator of Financial Mentor, explains that your values will be reflected in your spending. Determining what those values are helps you move down the road to financial freedom. Debt is an uncomfortable word for a lot of people. But there are smarter and faster ways to get rid of it than just paying a little more than the minimum payment. First, think about the types of debt that you’ve got. There’s expensive debt and inexpensive debt. The difference is the interest rate. While some financial experts advocate building an emotional victory by targeting the smallest balance first. If you’re disciplined and focused, and you’ll want to attack your highest interest rate and most expensive debt first. Your mortgage, if you have one, is more of an inexpensive debt. Even if you have a higher than average interest rate, it’s probably still much lower than the interest on your credit cards. Credit cards are an unsecured debt with higher interest, often in the mid-teens and up. Even though the debt amounts are lower than your mortgage, the interest rates make them expensive. The debt blaster method goes by different names. Dave Ramsey calls it the “Snowball” method, but the process is the same. You make your minimum payment on every expensive debt except the one with the smallest balance. On that one, you work hard to pay it off. As soon as it’s paid off, add the amount you were paying on it to the minimum payment of the next debt in line, continuing this cycle until all of the expensive debt is gone. Whether you target your most expensive debt or the smallest balance, as you start paying off debt you’ll feel a sense of freedom. And that freedom will build with each debt that you blast. Paying off debt and moving toward your debt-freedom target date will become a driving goal. And you’ll be amazed at how much extra money you’ll find to throw at your debts. Not sure? Try running a scenario in the NewRetirement retirement planning calculator to see what happens to your finances if you accelerate your payments? Sometimes with the best planning, some debts still linger and retirement savings and projected income come up a bit short. The good thing is that your retirement date isn’t fixed. Most people can choose when they want to retire. And that means you can hold off for a while, pay off debt, and also collect more in Social Security in the long run. Social Security gives you a range of retirement ages, but the benefits you can collect vary. The National Academy of Social Insurance says that early retirement begins at age 62, but with a hefty, permanent penalty. Benefits taken at 62 are reduced to 70 percent of what you would have received if you’d waited until full retirement age. Retire at 65, and you’ll get 86.7 percent. In 2018 the full retirement age has increased by one year to 66 years and four months. That’s the age that you can take full benefits and receive them, with inflation increases, for life. But if you wait even longer, you’ll get full benefits plus a permanent bonus. Hold off until age 70, and the amount increases by a relatively significant 32 percent. Every year that you wait to collect benefits past full retirement age, your permanent benefits amount goes up by 8 percent. That increase continues until you reach age 70. There’s no reason to put off collecting benefits past age 70, because that’s the bonus cut-off. If you want to see how early retirement might affect you, use New Retirement’s retirement planning calculator. An important part of financial planning is budgeting. Part of budgeting is tracking your spending. Seeing what you spend the most on is an enlightening experience. You may find that you’re spending too much in certain areas. You can allocate your finances in a more feasible manner. That extra spending could go into retirement savings. Mint – by Intuit, the same company who designed Turbotax. You can link your credit card and debit card reports to track your spending. Simple – easy to use, as the name suggests. The app links your bank account to your budget so you can directly influence your spending. Mvelopes – utilizes the traditional envelope style of budgeting in technology. You do have to link your bank account to use their system. GoodBudget – is another online budgeting platform, but you don’t have to link your bank account. You can either manually input expenses or upload a .csv file from your bank. America’s Cheapest Family Budget – this is for people who would rather track their money offline. Monthly budgeted money is kept in a bank account while expenses are tracked on individual budget category sheets. No matter which type of budgeting system you choose, the key is to use it consistently. If you set up one of these systems and use it to manage your spending for 6 months, you’re going to see some great results. Finding more monetary resources is tricky. One way to obtain more revenue is to start a side hustle. Think of it as a second job. This job can be part-time, freelance, contract, or even another full-time job. Pick something you’re already interested in. Chances are, there is some way to make money off of it. Can you make jewelry? Sell your crafts on Etsy. Do you enjoy writing? Become a freelance writer for companies and websites. If you’re tech-savvy, you can make some income by designing and building websites. Do you have an extra bedroom or two? Consider becoming an AirBnB host. Do you enjoy driving? Become a driver for Uber. Do you enjoy grocery shopping? Become a shopper for Instacart. Do you enjoy teaching children? Become a tutor through VarsityTutors or VIPKids. Here’s an idea: Have you ever thought about living in a commune? It’s not as crazy as it might sound, not when you consider that’s pretty much how TV’s The Golden Girls lived. Communal living can make great financial sense, and it can also make retirement years, at least for some people, safer and less lonely. UK-based Moneywise says communal living might be everything it’s cracked up to be. 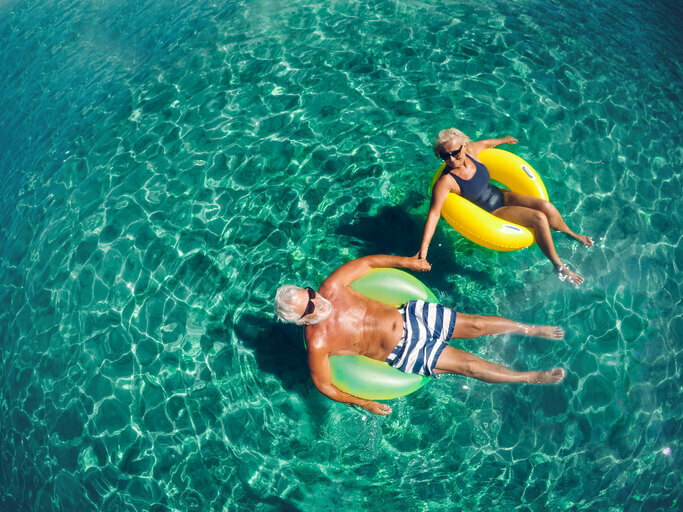 As retirement approaches, or even later on in retirement years, you and a few friends or family members could sell your respective homes and pool your resources to buy one larger home free and clear for all of you. The benefits are fairly vast. There’d be no mortgage, or maybe there’d be a small one. You’d never be alone, so if you needed help someone could make that call for you. And with master suites for every property owner, you’d also have your own refuge. Privacy wouldn’t have to be the sacrifice. The deed on such a property is a bit tricky, but your lawyer can accomplish it through Tenancy in Common. NOLO explains that each person or couple can own a different share in the property, unlike with Joint Tenancy where shares must be equal. This is important, since some people in the pool might have more to contribute and some might have a lot less. Tenancy in Common also allows for separate provisions for when any single owner of the property experiences a life change. If you’re handy and would love living in a different city or exotic location, consider becoming a caretaker for a larger estate. There are opportunities all over the world. In most situations, you live rent free while performing or coordinating maintenance and repair duties. Other positions include pay in addition to room and board. There are currently more than 10,000 people working for camps, parks, nature preserves and individuals as property caretakers. The Caretaker.org lists opportunities in the U.S. and around the world. Living a lifestyle with constant consumption will drain your pockets. There’s nothing wrong with wanting to live a lavish lifestyle. However, Todd Tresidder points out that so much spending on expensive things won’t help you gain financial freedom. Take some time to evaluate your purchases. Will this product help you in the future, or will it be used up quickly? Will the product improve your life in any way? More importantly, will the purchase add value to your financial freedom? By asking these questions, you will save yourself from overspending. The money you don’t spend can be used toward savings. Instead of using cash on nonessential items, devote that spending to something profitable. For example, “buy” a Roth IRA for retirement. Roth IRAs are retirement accounts that you fund with post-tax income. There are no up-front tax deductions. But, Roth IRAs are tax-free. Each cent you put into the IRA is your money. You can take money out any time without penalties. Health care might not be your first thought when you imagine a financially free retirement, but that would change in an instant if you needed care that you couldn’t pay for. Yale University’s Institution for Social and Policy Studies explains something that a third of Americans don’t realize: If you need long-term or skilled nursing care in retirement, Medicare won’t cover it until you are literally impoverished. Longer lifespans mean you or your spouse might need long-term care one day. With the annual cost of nursing homes and similar facilities hovering around $90,000, your retirement savings could evaporate quickly. If your spouse still lived in your home, Medicare couldn’t claim the residence to help pay for your care. But at your spouse’s death, the home would go to the State. Not only that, as your financial resources dwindled to meet the level when Medicare kicks in, your spouse’s quality of life would be markedly different from anything you’d imagined. The solutions aren’t perfect, but awareness of the problem helps you plan for it. If your income allows it, you could save enough to one day cover the cost of skilled nursing. If it doesn’t, you could buy a long-term care insurance policy. These are expensive products, according to Yale, but they are much better than the alternative of not having one and not having the personal resources to cover care. Explore creative ways to cover a long term care need. Achieving financial freedom becomes easier when you have someone guiding you. While you don’t necessarily want someone to hold your hand, having a mentor will help you make sense of everything. A mentor can be a friend or co-worker. They should be someone who will hold you accountable to stick to your strategy and plans. They shouldn’t expect to be paid. After all, you could go to a financial advisor and pay for professional advice. But if you simply want someone to help guide you, find a good mentor. Your mentor doesn’t have to be physically present either. You may admire a certain financial advisor. Follow their blogs and social media accounts. Stay updated on their advice and tools they offer. Find similar blogs and people of influence. Follow who they follow. Finance trends and retirement trends are changing every day. According to Todd Tresidder, retirement has changed over the past few years because the average life expectancy has changed. Years ago, retiring at 65 meant you only needed to save money for at least ten years. Now, with life-expectancy increasing, we must plan to save money for years and years after retirement. Keeping yourself informed of new legislation, trends, and tools will aid in attaining financial freedom. Follow prominent financial blogs. Stay in touch with your financial advisor if you have one. Listen to podcasts. Podcasts are a great way to learn new things when you’re too busy to read. They are a great multi-tasking tool. Get started with these 15 lessons from regular people who have achieved financial freedom. Financial freedom for retirement is not going to happen on its own. You will need to create a retirement plan and evolve that plan to suit your ever changing needs. How much do you need for retirement? When can you retire? How much can you spend each year? How much will you be earning? Will you run out? These are all questions that need answers. However, the answers will shift slightly from year to year as the economy, your finances and your even your health change. Retirement planning is not something you do once and then never revisit. Working with a financial advisor is one way to figure it all out. Yet, as Todd Tresidder points out, financial advisors can be expensive. An alternative to this is a retirement calculator. The NewRetirement retirement planner is one of the the most comprehensive and powerful tools available. Forbes Magazine calls the system “a new approach to retirement planning” and it was named a best retirement calculator by the American Association of Individual Investor’s (AAII) and CanIRetireYet. Start by inputting your existing plans, then try different scenarios to strengthen your future finances. Best of all, the site saves your information so you can make updates and maintain your plan over time. One new trend in financial freedom is FiRE (“Financial Independence / Retiring Early.”) Those who practice this focus more on finding value and fulfillment in their lives. Not necessarily through money, they also focus on mindfulness. It’s about planning for your future as early as possible. It’s an extreme lifestyle that calls for frugality and a lot of saving. Those who stick to it are already saving plenty of money for their retirement. They stick to their beliefs, which is something we can all learn from. The FiRE lifestyle also promotes being efficient with money in many ways – not just investing. Many people have had success with this lifestyle. However, it is a lifestyle that may not work for everyone. FiRE works best for people in simple situations. This includes younger people who don’t have many debts or spending in the first place. And those who want to live in smaller or “Tiny Houses.” They not only spend less, but they tend to have a smaller carbon footprint too. People who have more debts to worry about may find this lifestyle difficult to live with. The nice thing about Financial Freedom is that your strategy can be as unique as you are. It doesn’t have to be like anyone else’s. Preparation is what’s important. You can’t plan for every possible scenario. But you can consider many common problems that are likely to happen, choose the lifestyle that you want to have later, and create a plan that works. Some retirement preparation steps are clear, such as paying off debt. Others can be more innocuous – like exactly how much money you’ll need. But if you’re not sure how much income you’ll need, NewRetirement can help. Using this award winning retirement planning calculator, you’ll get a clear picture of where you are now, learn how much income you’ll need later, and find savings strategies that work. Financial Freedom is not a final destination, but it is a wonderful goal and an amazing journey to travel. Disclosure: Some links on this site, like the Amazon links, may be affiliate links. If you click on one of these links and buy from the affiliated company, then we receive some small compensation. The modest income helps to support our work. Affiliate links do not increase your cost, and we only use them for products or services that we’re familiar with and that we feel may deliver value to you.